Have you ever bit into a sticky piece of candy only to find out that the candy grabbed the crown that your dentist just put on your tooth? If so, you’re not alone! Many people lose crowns from their teeth. A crown that fell off is a common “emergency” that we see at the dental school. You may be curious why your crown fell off. To satisfy your curiosity, I’ve written this article to let you know about some of the reasons that crowns fall off teeth. 2 – The cement holding the crown on wasn’t strong enough. This could be due to contamination of the cement while it was being prepared or any number of other reasons. If this is the case, your dentist can usually re-cement the crown back ont your tooth. 3 – You ate too many chewy foods. As you can see in the picture above, one jelly belly was all it took for Bev Sykes’ crown to fall off of her tooth! Over time, sticky foods can gradually work a crown loose. 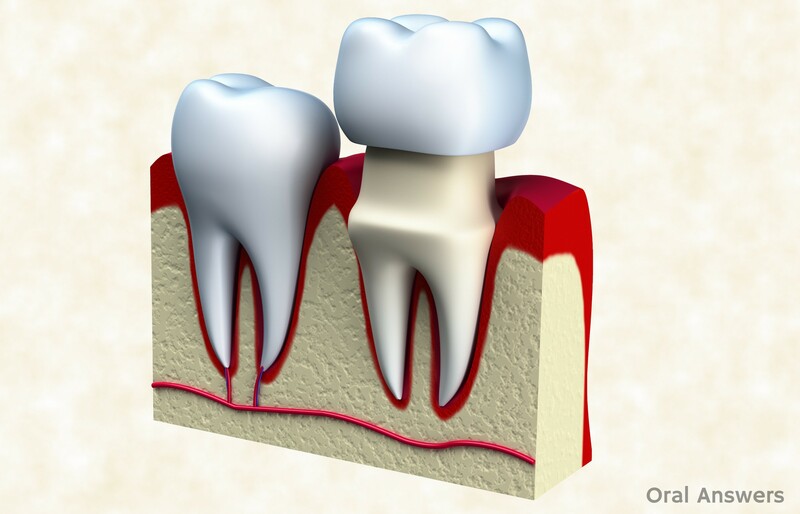 When the crown is pulled off by sticky food, it can usually be re-cemented onto the tooth. 4 – The crown broke. In some instances, due to lots of force, the crown can break and fall off the tooth. Sometimes a crown can gradually form a crack that eventually loosens the crown’s seal with the tooth and knocks it loose. 5 – You abused your crown. Maybe you used your teeth as tools, or you ended up putting unnatural stresses on the crown by grinding your teeth. In any case, when you subject your crown to unnatural forces, you stress the bond that holds the crown to the tooth. 6 – There wasn’t enough tooth structure to hold onto the crown. Sometimes the teeth are so short that when dentists prepare them for a crown, there’s not much tooth left for the crown to “grab on to” when it is finally in place. This is more common in back teeth that have been worn down over years of use and are short. There they are! If your crown fell off, it was most likely due to one of the reasons mentioned above. It is always best to go see your dentist when a crown falls off. If you can’t make it to your dentist in a timely manner, they may recommend that you pick up some temporary crown cement from your local pharmacy to hold the crown on until you can be seen at the dental office. Do you have any questions about crowns and why they fall off? I’d love to hear any questions or comments you may have in the comments section below. Thanks for reading! What’s the Best Temporary Crown Cement and Method to Re-Cement Crowns? back tooth crown has fallen off 3 times. dentist made a whole new crown. looks as big as my pinkie nail. just got replaced 2 weeks ago. no cost to me. he said he made it a little longer and to go deeper into gum line. fell off today. what is up with this. the tooth looks like a little nub of nothing. how could anything adhere to this. any other suggestions, what about laminate? Hi JM – Sometimes teeth are so broken down that it is really hard to adhere a crown to it. We usually need at least 2 millimeters of tooth structure around the entire tooth in order for a crown to adhere well to the tooth. I’m not sure what the condition of the tooth is, but your dentist will be able to offer you all of your options. I hope everything goes well! Let me know if you have any other questions. Thanks for your comment! It definitively sounds like your prepared tooth is too short. Usually not much can be done because the opposing tooth will not allow for any more room. Probably the best option is for your dentist to use resin cement. It is the strongest dental cement out there. I lost a crown while flossing, and the dentist said it had come off due to poor fit. There was a large gap between crown and tooth, filled with dental cement, and apparently cement isn’t designed for this. Is this common, and is there any recourse if your dentist does a bad job like this causing later problems? Hi CD – Ideally, the crown is designed to fit very tightly onto the tooth with only a small gap (measured in micrometers) for the cement. I’m not sure about recourse you can take other than talking with the dentist and telling him/her that you have to have the crown re-done and you don’t feel like you should have to pay for the first crown since it was defective. I had a dental implant done 5 years ago .It came out a few times and last year the gum grew up under the loose crown and became infected and some dentist (not the one who did the implant) wanted to put a hole in it – yank it out crown and my implant (only been using temp cement).I went back to the oral surgeon he removed the excess gum and recemented the crown. It lasted only 16 months.In June it came out and some standby dentist said all my bone structure was bad and wiggled the post said it was loose and got angry with me and I went back to oral surgeon again. The oral surgeon said it was fine and maybe my bite or to use a stronger type of cement.It is out again and now the new dentist wants too see me about my bite etc. I do not trust these people twice they were wrong.They are under new management I know we are in a recession and they push for sales. I grind so I noticed I have one short old filling on top and one old tooth with a filling that kind of rests on the crown. What do you think? I had my bite checked before the implant was done. Help!!! Hi Mary – Do you have a night guard to help with the grinding? It would probably be a good idea to find a dentist who someone you know can recommend to have them look at the implant and give you a second opinion. I hope that helps. Let me know if you have any other questions. Hi, I have an appointment to have moulds made for teeth whitening but have had to get a crown put on for a cracked tooth. I’m worried about the crown being pulled off when making the moulds… How long should I wait between having the crown put on and having the moulds done? Hi Colette – Depending on the type of cement used, the crown cement should be fully set within a day. If the crown does come off with the mould, it means that it didn’t have a strong enough bond to the tooth. I hope that helps – Thanks for your comment, Colette. Second time this happened but to a different crown. Does my dentist know what he’s really doing? Why should I have to pay full cost if it fell out? so, what did they do about it, could it be fixed? Huh. I just had a crown fall off last week, one of my top front teeth. It was always a tiny bit wiggly, but then so many months ago once it was wiggly enough I got in the worry habit of wiggling at it, and soon enough it came out. Also grind my teeth in my sleep. It stays in good enough except when eating, or dry mouth, or certain emphatic speech sounds. Oh well. Flies out a few times every day, and always when eating. Once I get a job I’ll get it cemented in. Was a metal post ground into the remnants of the tooth. Rather wish I hadn’t acceded to the dentist’s recommendation to have it on, the original dead tooth never caused any problems at all for fifteen years, and the crown’s been a pain of falling out. The temp crown cracked off on a banana peel or french bread crust I bit to start, and it subsequently disappeared in my sleep and actually had to go a few days until the permanent crown with no front tooth, feeling like a hick. Need crowns on all my molars due to bad enamel and tooth grinding in my sleep, starting to have pain. hi i just have a quick question well i just got my temporary crown and bridge on my 3 front teeth i was wondering can talking make it fall off? ?because im going to be preaching and singing this sunday and i dont want it to fall off so i was just wondering if it is possible that it can fall of while talking??? How much of your time do you spend suing dentists?! I’d be terrified to take you guys on as a patient ffs! I would never sue a dentist or a doctor. They do the best they can with what they have to work with! I would suggest sue happy patients take a DIY dental course. This way you can sue yourselves when your not happy!! I had a crown but in at the front of my mouth about 15 years ago and it has just popped out today while i was flossing my teeth, i wasn wondering if thre is any chance if my dentist can glue it back on or will i need a new crown. The tooth below is quite black and i feel it fell out because there is not white clue attached to it…..do u think i will need extensive work done as i am worried it wont b able to be saved. i had a lot of work done on my mouth over the summer, i had two root canals done then i had to have both of my front teeth crown now by my teeth been growned down so much one of the crowns keep coming off, but i looked at it and it has nothing to hold on too. so what’s the next step can this be fixed or have i gotten a bad crown job done this is bad. I am having a crown placed on 18 (back molar) and wanted to get your opinion on gold versus zirconium. I have very limited space and I am looking for longevity. Have you heard of zirconium causing issues with opposing teeth? Have you seen cases where gold becomes an allergy problem? Do you find one superior to the other in terms of staying on/bonding?? My question right now is, can braces have caused a crown to move and be misaligned, or the tooth move and not the crown? When you get braces put in,and you have a dead tooth witha crown, wouldn’t you remove that tooth instead of a healthy tooth?? Recently this bottom tooth that is capped crowned post became loose, so I tried not to eat on that side before I got a dentist appointment, but i forgot and while I was eating a poptart today 🙂 lol the whole entire thing just fell out of my mouth and into my hand!! the permanent crown, the post and some other rod like thing coming out of it!! Now I have a big large hole in my mouth with only a very tiny sharp piece of tooth in there! I am worried because it is saturday and dentists offices do not open till Monday, and I am hoping this is not considered an emergency! there is no blood, no pain or anything just an uncomfortable weird feeling in the gum pocket that looks like it goes so deep… I have rised it out with peroxide on and off all day today, and I have saved the whole permanent cap crown post rod thing, but I am not sure if the dentist will even be able to save this and put it back in my mouth… I mean what would this rod like screw thing even adhere to if there is only a very small tiny pointy piece of tooth left? I noticed that you responded to others that maybe getting some temperary cement to hold this crown cap thing in place would be appropriate thing to do… But my other question would then be, where does the rod screw like thing go into? that’s what I cannot figure out… thanks for any advice you may have and I am lookng forward to your response!! I truly hope you still are part of this blog because I could really use your help and advice..
Hi Lisa – I’m still here! It looks like when that tooth had a root canal done on it, the metal rod was placed down into the root to help give the crown some extra traction to stay attached to the tooth. If you apply temporary cement, you can put it on the rod and there should be a small hole in the tooth where the rod will fit into if that makes sense. As long as you’re not in pain, we usually will wait until after the weekend to take care of these sorts of things. If you have any questions or doubts, you can call your dentist – most have an answering service where you can still get in touch with the dentist to ask a question. I hope that helps and that you have as great of a weekend as you can considering the circumstances! Hi. Hopefully you still check in from time to time. I have the same post-crown set-up. About every three years it comes loose. This time I am 950 mi away from the dentist that made the initial repair. What can I use to stick it back on for a few more years? Thank you. I have something similar to the above post, but there doesn’t appear to be any screw or hardware of any sort attached to the crown. Last month I noticed that once in awhile I could feel a little movement back in there when I was eating. I currently don’t have dental insurance, so I’ve been being very careful about what I eat and chewing on that side of my mouth 🙁 Well, the inevitable happened, the crown came off yesterday. I’ve been thinking to myself that when it did come off I’d get the crown adhesive stuff from the drug store as a temporary fix…. Well, the crown isn’t hollow, it looks like my tooth is in the crown (ewe), to be honest it’s pretty unsightly. I just have a hole in my mouth, it’s really hard for me to see what going on up there (it’s 2nd to my last top molar), pretty hard to see…. Would it be unsafe to put the adhesive on the crown and the tooth-like looking stub that’s coming out of it and just stick it in the hole?? I’ve been afraid to eat and have been rinsing with peroxide multiple times a day…. I hope you have some advice. I know I need to see a dentist, wish I could afford it right now. Started a new job this week, awesome benefits kick in in 30days! I forgot to mention, thanks for making this blog! I know this because there’s nothing there! It makes me feel sick to my stomach just thinking about it, I can’t wait to have this fixed! I think Tom has done an excellent job advising the public on crown care. Flossing around the crown and avoiding certain foods is the way to go forward. People complain about limiting their food choices but we as people pride our dentition so sacrifices have to be made. I wish you the best for your tooth prognosis and certainly you read up on how best to maintain any existing and future dental restorations. Hi…my crown and post fell out. It was inserted in May of 2011. The first time it fell out was 2 months ago. I called my dentist only to find out that she has sold her practice. The new dentist said she is not responsible and re cemented it, charged me and said I really need to get a bridge. I decided it would be too expensive so opted for the re cement. Now two months later, it has fallen out again. First of all, isn’t the new dentist responsible since she bought out the practice/? Second, why didn’t it stay in for longer than 2 months? I. also wondering whether I should just keep getting it re cemented for $8 instead of paying thousands of dollars for a bridge. I have two other places in my mouth which need bridges also so at this point, it is financially impossible to keep up…Its like the cost of buying a new car! Thanks in advance for your response. hi. i have a silver cap on my top back molar and my bottom tooth started hurting but now my tooth under silver cap is hurting. so i was trying to test it out and see if it was hurting because its loose. but now its a little loose. should i try taking it completely off? BECAUSE im tired and want to sleep but im afraid i could swallow it in the middle of the night and theres no way to get ahold of a dentist at this time. What about a dentist DELIBERATELY having two crowns made for front teeth when the teeth are damaged, and loosse and he has been told three times by the patient that the head of the UCONN Dental Clinic stated that those teeth could NOT support crowns? Does that qualifoy as a reason? Hi, my dentist attempted to beat my bridge (4teeth, 2 crowns and 2 side false teeth) off with a rubber hammer. He hit the front crown 10 to 15 times. I felt the pressure all the way up to my eye and pain, even though he had given me a local anesthetic. The back crown had already came loose previously and his rationale for using this method was to break the cement loose on the front crown, put a filling in the back crown, and re cement the bridge. He had stated that the X-rays were showing small decay in the back tooth under the crown and none in the front crown. This did not work and he sent me home and said to eat sticky foods. After 1 week, the bridge was still on, so I returned to the dentist, where again he started beating the front crown. After 3 times, I told him to stop, I couldn’t stand it. He then cut the bridge in half and the back crown bridge fell off. The tooth could not be repaired after all, so he pulled it. The front bridge that was left was now loose and starting to hurt, I told him, but he didn’t answer. Two weeks later the front bridge fell off. I went back to the dentist and the tooth had fractured and was inside the crown. I asked him, did all that beating on that tooth make it fracture and he said no. I feel like he is not accepting the responsibility of fracturing my tooth and now it cannot be saved. I feel like a fool for ever allowing my dentist to perform such a barbaric method of bridge removal on me. The crown in front would have probably lasted several years longer if he had not beaten on it. Please, I would appreciate an answer, because I am seriously considering filling a complaint with the State Dental Board. I would have cut the bridge from the outset in the first visit. Yes it sacrifices the bridge which cost money but everything has an expiry date. However it depends on how sensitive the patient is to the bridge being cut. Sometimes a dentist can be spurred on to save the bridge and begin to to things that are questionable. A general dentist placed a crown on a lower bicuspid tooth. It had no contact with one of the teeth next to it and food got caught in the gap after every meal, which I flossed out. Also, there was some tenderness and redness in the gum around the crown. When I went back to the dentist, he said it was due to crown lengthening and it would heal in 6 to 12 months. The symptoms did not improve and In about 15 months the crown fell off. The dentist said he had no liability on it and refused a refund that I requested from him, as the crown had to be re-done. I had the exposed tooth evaluated by 2 separate dentists. None of them found a crown lengthening. A post was also not found. A build-up like material was stuck in the detached crown. My new dentist placed a post and build-up on the tooth and cemented a new crown. He said that the tooth was very weak now as the crown had to be re-done. An implant may be needed in the future. Is the dentist who did the first crown liable and should he refund me ? I am in California. I got your message forwarded to me (and to others on the Oral Answers web site). I posted a message as well, under “Nel”. I did not receive an answer from the dentist (Tom) yet. I read your post and found it very concerning. I am not a dentist but had a lot of dental work done. If the teeth under the bridge (which fell off) turned black, it does not sound good, especially as you have also pain. Could be a decay situation, possibly even infection in a root or roots, also a fracture, I speculate. Your teeth were not black most likely when the dentist placed a bridge on them, because teeth are “white”, even if discolored (“yellowish”). Is there a community service in your area, where they may have a list of low cost or free dental service places ? Also, dental schools offer low cost or free dental work. You’ll have to have it taken care of, the sooner, the better. I’m awaiting a response from Tom to my above placed message. He doesn’t answer all messages. I have had a terrible sinus infection for almost 3 months. I am seeing an ENT and they keep treating me with antibiotics. When I finished this last one after about 3 days, my Eustachian tubes became quite swollen and my sinus area too. In addition, 3 of my crowns came off my teeth. I put them back on and went to the dentist. He couldn’t get them off. Now a few days later my 4th bridge has come off (it’s only 2 years old). Could it be the sinus infection putting pressure on these crowns? I just don’t understand why all 4 of them are coming off? My problem is identical to ‘Rochelles’ experience! I’m sorry to hear that, Maggy. The dentist may have made the upside down cone shape to help the crown have more internal tooth structure to hang on to. Are you having any pain on the tooth? Any idea if it has a root canal? Good luck! I have a shaved tooth with a crown on too that has fallen off.. It has an Oder and the tooth has a grey color too it. The gum around the tooth is swelled up a little bit. I cant afford to go to the dentist anytime soon and i dot have insurance. Ishoupd i still put the crown back on the tooth? And is there anyway to get rid of the infection like salt water or something ? It sounds like you have an infection. You need to see a dentist to drain that area of infection and/or get an antibiotic course. I understand you can’t afford to see the dentist but unfortunately people forget about maintaining their dental treatment. A pair of jeans has to be replaced depending on how much it’s taken care and it remains the same for your dental treatment – even if it’s just a review. I am concerned why my son went in last week got a crown and it fell off today? His dentist said repeatedly it was my fault. Please keep in mind I have not gave my son any soda he has only been given water and milk to drink since last week. I have been scared that a crown would come off so I have had him on soft foods and soap. I’m very interested on knowing. However one week is too little time and probably reflects on how the crown was fabricated or the cement mix used to fix the crown was too thin/weak. Recently had a root canal! My tooth broke off at the gumline and needed a crown; however they shaved some of my guns and bone so my crown would attach to more of my tooth! My bandaid just now can off a week later and there is a hole!!!!! Is this normal! Will my gum tissue grow back? I have porcelain metal fused crown in the bottom left. I went to see a dentist who said I needed a new crown. To be honest, he didn’t make it clearly at the start he was going to give me a new one. The problem with the old one was porcelain contacting with another tooth is missing. The suspicion was that whoever put in at the first place had trouble to fit it in so chipped away the porcelain on purpose. Is this a good reason to have a new crown? Plus the dentist said there’s too much decay in the area underneath the crown (not just at the junction of the gum and crown). What should I do? Thanks. had under it broke all the way to the gum line and it looks like its decayed. I look hideous and feel like dying. Right now I do not have insurance due to my husband changing jobs. If I need an implant I’m screwed because I won’t be able to afford it. I Cant stop crying. This is such an awful feeling. I dont know what to do? I had my crown about 3 years ago and it has just came out. would I have too pay for a new one and if so how much? it was actually a gold inlay. I had a crown put in almost 3yrs ago. I noticed after having the crown placed I had bad breath. No matter how much I brushed, flossed, etc the bad smell was still there and recently about 4wks ago, while chewing gum my crown came lose on tooth #19. Now today, I noticed the upper back left side of my gum is really swollen. What can this mean? An infection? Or a wisdom tooth trying to breakthrough? Hi, About 3 months ago my top front tooth broke off at gum line. All my teeth are splitting in pieces or slabs braking off. I have extremely dry mouth from medications. I have tried all the different products for dry mouth, nothing helps for more than a few mins. Anyways, had a crown put in front, and noticed it felt loose last night , tonight it broke off at gumline . I saw it had decayed at gum where it broke. After seeing all these other people having so many problems with their crowns, I’m wondering if it’s normal for these things to happen or if it’s all cause by improper placement of the crowns. This is my 3rd crown. The other two constantly fell off, so ended up pulling those 2 teeth. Only had crowns for 2 yrs. I hate getting crowns cause it sure seems like a big waste of money . Can’t believe my tooth decayed in a matter of 3 months . Do you think crown wasn’t on right ? I also had a purple discoloration on gum around crown. dentist said it was either bruising or a tattoo . Don’t know what he meant by that . Thanks in advance for any answers ! I started seeing a new dentist six years ago. I had vowed to take better care of me teeth. Over the last six years I had no less than six crowns put on my upper teeth along with a 3 piece bridge on #’s 6,7,and 8. 7 had been extracted. The crowns lasted an average of one year then one by one they would break off tooth and all at the gum line. In the privacy of his office he admitted they all should have lasted longer and he accepted full responsibility and offered two solutions at no charge to me. I was not crazy about returning to the Man that single handed destroyed my mouth. He tried to blame it on some medication I was taking saying it caused the teeth to be dry and brittle. The only problem with his weak theory was during this same time span not one single lower tooth had any problems. That blew holes in his theory. Looking at my one and only crown left on my uppers I noticed the Crown is ill fitted. It does not cover the entire tooth and leaves a gap at the bottom where the tooth is exposed. I don’t have to theorize why they all met the same fate. He screwed up. People be careful who you choose as a dentist they are not all the same. Better yet get lots of good referrals from actual customers. It’s too late for me now as I have to first find a surgeon to cut my gums open to remove the broken roots. Then it will be a denture which I don’t look forward to. I recently had my silver filling removed and my teeth were extra sensitive after. After 5 visits to correct my bite my dentist said I needed to get my one tooth crowned and that would stop the sensitivity. There was nothing wrong with the tooth and completely healthy. Is that normal to crown a tooth for being sensitive? The root was fine and not exposure either. My bite was off since they did filling and now thati have the crown my bite is better and think that was the problem the entire time. If your bite is off that can cause sensitivity. I have a problem with sensitivity and one thing that works good for me is Crest makes an ultra sensitive formula tooth paste. After a few brushings it really quiets the tooth down. Hope this helps. My crown fell out this morning and is full to the brim with debris and nothing really left in the gap left in my mouth – am I right in thinking that it is not going to be possible to reattach? What are my options going to be? Do not want to have to have an implant! I had root canal done 8 years ago and yesterday the cap popped off while flossing teeth. Dentist says only option is Bridge or Implant. Insurance won’t cover implant. He took me in on Saturday to look at it and replaced the cap. I have been having the worse pain since then? I am going to have a bridge and pray that takes care of it. My crown came off last night and my dentist can’t get me in until next Wednesday afternoon. Between now and then, is there a chance that the exposed tooth can become infected? If so, is there anything in particular that I can do to combat any infections? thank you for any info or advice you can give. I had a bad experience at my dentist- first she injured the underside of my tongue in five spots and it hurst a lot of course. Then the temp crown fell off that night with just brushing. Then the next day I went in to thane the temp crown done again. They did a whole new impression and everything. That night, over some spaghetti, the crown came off again. I feel very frustrated with the dental office. How can I find a dentist that can actually do this right? I live in northern california. Also is it typical for dentists to make you pay the entire cost of the crown and the work involved up front? Hello, I had a crown put on my front tooth. Number 7 after a root canal. It was permanently put on on March 3rd 2015 and by April 24th it came totally off taking the little bit of tooth filed down with it. So now there’s nothing there. Can you please tell me why a permanent crown would come off in that short amount of time. And I never used it to bite things like I may have with my real tooth. It’s like I was walking on egg shells. But now I’m so very upset because from what I’ve learned and also read here, this shouldn’t have never happened. I am hurt and disgusted by the nonchalant attention I’m receiving from my dentist office. Can you help or tell me something? I am 60 years old, living in Viet Nam. Two years ago I had many crowns, bridges with porcelain-metal type. Some root canal done and the others still alive. Around 2 weeks ago I feel sensitive with cold water, this happen at the teeth n# 1.6 and 4.8. Do you think that the cement between the teeth and the crown crack so that water come in while I drink ? I ask my dentist but she said that no problem. How can I do ? I have had a lot of dental work and mostly have crowns. At one point..three of my crowns fell out at one time like dominoes after 3 years, not only was it very stressful but financially a large burden. My dentist never really explained why but only just to try to sweep it under the rug so to speak. I had to have two implants with a bridge. I finally wised up and left my dentist after having a regular check up with him and being told that everything else was fine: I got a second opinion and found there was problems. I had a crown on my 2 teeth together but now after 5 years 1 underlying teeth is broken so there is no structure to cement crown in 1 teeth but another underlying teeth is fine up til now, Please guide me to fix crown again without dental implant. what if dentist cement crown on available structured teeth so it will heal both the teeths? If a dentist has seated a finished crown and has made all the final adjustments, has mixed, loaded the cement and seated it but It’s still not seating completely what could be the problem? Thanks for sharing these reasons why a dental crown may all off. My grandma’s gold crown came off and I think it was because of the tooth underneath decaying. Is there a way to prevent this from happening to her other teeth? I’m not sure how to clean a tooth with a crown on it. Why was my dentist not able to remove my temporary cemented crown??? My dentist pulled and pulled and was not succesful at taking my temporary crown off, to be able to put it on permanently…?why?? Thanks for giving these reasons about why crowns come off. I just had a dental crown come off tonight and the tooth broke; part of the tooth is embedded in the crown. I am not sure if the tooth can be saved. I have had this same situation happen 5 other times, all in the upper jaw. I have crowns in lower jaw but have had no problem with them. One I have had about 25 years. I have one implant in the upper jaw and am getting two more at the present time. I had the teeth pulled and a bone graft in September. I don’t understand why this keeps happening–it may be that my teeth are quite soft or could it be some fault of the dentist? I have been thinking about getting an evaluation from another dentist. My dentist doesn’t give me any explanation of why this is happening. He just said “This happens some times.” I guess I should go to my dentist to see what he has to say and see if he thinks he can make a new crown but do you think I should seek the advice of another dentist? Thank you so much for this great service! The reason why your crowns come off – the X-ray cannot show the tooth underneath if you have metal reinforced crowns. The only way to check underneath your crown is to have it removed regularly to check what’s going on underneath. Why don’t we? Because it means a risk of damaging the tooth itself and the crown that you’ve paid for every time we remove it as the cement is very strong. Are you a dentist?This was not a metal crown but a porcelain one. I just had a check up with hygenist and dentist within the last month. What about digital x-rays (my dentist does not have) Can you see beneath crown with digital? Do you think I should seek a second opinion? Thanks for sharing all of this information. I have a crown that has recently come loose – I had a root canal in the tooth and the x-rays show that the post isn’t in the actual tooth canal. My dentist thinks I will most likely need to have the tooth extracted and an implant put in, though I’m holding out hope there is enough tooth left to re-cement a new crown. My question is regarding the safety of either of these procedures during pregnancy. I just found out yesterday that I’m expecting, and although I’m overjoyed, I’m very anxious about my tooth situation. I know it is not ideal to put this off until after the baby is delivered – is it even an option? I have a crown that has recently come loose. After looking at the x-rays, my dentist told me that the post was not actually in the canal of the tooth and is therefore spinning on it’s axis causing the crown to come loose. He believes the tooth will need to be extracted and an implant put in. I’m holding on to hope that a new crown can be re-cemented on. My question is regarding either of these procedures during pregnancy. Are either safe? Is this considered a dental emergency or something that can be put off until after the baby is born. I’m terrified of doing anything that may affect my child’s health. Irrespective of pregnancy the dental procedures carried out today will always outweigh any risk/harm to the patient. However due to psychological dilemmas and to put moms mind at ease we usually delay treatment until after baby is born but again this depends on procedure. Help Husband wants me to switch dentist,have had to have crown put back on within 3 months of getting(1st prob. with temps staying on acually got home &1 fell off when walked in door 2 other times in 2 wks>dentist acually tried to fix the wrong tooth till I spoke up)Just got the bill for less than 5 min. for dentist to glue on for 100 $This is after he told me thanks for cleaning old glue off!Help there have been too many other prob. to mention over the years I like him but this is getting to peeve me to no end….? HAVE HAD SEVERAL CAPS FOR OVER 30 YEARS. TODAY, ONE CAME OFF. DENTIST IS 1500 MILES AWAY. HOW DO I KNOW IS IT CAN BE REATTACHED? Hello my daughters crown fell off and she is 4 years old and got it pit on I wanna say almost two yeare ago what should I do. The cap is cracked on one side. Help – I broke a crown last month, corner snapped off. Have appt to repair on Monday. I had a root canal done on this tooth with crown about 2 yrs ago. Yesterday I think remainder of crown came off which I swallowed (!) BUT there is this tube/straw-like piece projecting from remaining tooth. Called dentist & went to their office today but everyone is out. Can I put some sort of wax/glue on this until my appt on Monday in 2 dys? Hello Tom, your help would be greatly appreciated ! My wife has lost her crown 3 times (last one only lasted in place for 2 months). It seems that the implant doesn’t have enough height to provide enough surface for the crown. Would this be considered a defective implant design? So would it be reasonable to request to remanufacture the implant at no cost? I forgot to mention: this is about a complete dental implant (molar). My implant crown fell out for 2nd time while flossing. It was 1st put in in August this year and fell out in less than a week. This time it lasted longer, but I’ve been to dentist 2x because of numbness and tightness. Dentist keeps insisting crown is not the problem. Last saw him 1 week ago and he suggested I see a prosthodontist who comes to his office BUT I have to pay $150.00 dollars. Now crown has come out and my mouth tastes awful. Kind of like old onions? My husband says it smells like a chemical, kind of like super glue. I’ve rinsed a few times but still have that taste. Do you have any idea what could be causing 1. the numbness/tightness, 2 the crown coming out and 3 the awful taste. Thank you in advance for your opinion. 6th possibility: Periodontist hygienist not careful with sharp thing around crown when cleaning! Mine fell off the next day eating mushy cereal! Upper right tooth next to canine. Can’t believe it! Today is Friday night before Christmas! Will my dentist be in Monday? Had teeth bonded; all removed by same hygienist when cleaning! Maybe I need another person to clean my teeth under the gum line. A possibility I’m sure. Forgot to say, it’s a GOLD crown. Hey tom Ds is mahima from India..had veeners in front two tooth two weeks ago…ached for a few days on its own..now it aches only when I touch or bite anything…when I touch my tongue on d back d veener moves a bit wd a tak tak sound…shud I wait for a few days more to let it set…or shud I see dentist..I talked to him he said to wait…just wanted ur opinion..no sensitivity. .
My crowns keep coming off and I think that my Dentist doesnt leave enough tooth for it to adhere to. I just lost my 2nd one and there is only half of the tooth left so now I cannot re-adhere the crown. Now I have two missing teeth and cant afford to get implants. So upset. Good article. Have been fighting with my dental work for years – starting in my mid twenties when I lost two bottom molars close to the back – two 3 tooth bridges was the solution then. Two years later – crowns needed on teeth right above, dead center where missing bottoms were. At that point, my front bottom teeth were showing extensive wear and they told me if drastic things weren’t done, I would end up with no front bottom teeth… Then, dentist decided to “contour” my teeth since my bite was now off and that began many more crowns, bite retrofitting, etc. Now, many years later, dentist is adamant that I have sleep apnea because of the grinding she sees on my teeth. Sleep disorder appointment is already scheduled. I wonder if all this ill-fitting dental work is why I now have what is characterized as an iron bite…and it is cracking my expensive dental structures……any thoughts ? Well, I didn’t get much of a reply on last post so will do update, hopefully…. Have now been to sleep disorder doctors office and acquired overnight sleep measurement devices to do sleep study at home. Results: very minor sleep apnea….dr. said I could chooses whether or not cpap was the solution – decided to wait on that because of so much dental procedures coming. Then, went to Prosthodontist for evaluation on two lower 3 tooth bridge replacements. One was replaced and the result is good well-fitting bridge made of mostly metal with a little porcelain on the sides to emulate the rest of my teeth. Then, we started process for the other bridge. It was discovered upon removal of the old bridge that my two anchor teeth were no longer stable. Then was sent to Implant and Periodontic Specialists for implants. Two teeth removed and awaiting bone growth to allow two implants….then I go back to the Prosthodontist for the second bridge replacement. That doctor had made me a night guard and I have found that it seems to be helping me not destroy more or my other dental work. If everything goes well, I should have my bridge back by next year…..sheesh….and here I thought I was preserving my teeth with all the crowns, bridges, over the years….boy did I have another think coming…. Please help! My face/cheek/lip area is very swollen and painful. I have started taking antibiotics but not acting fast enough to stop the pain or swelling. Doctor said i need a crown replaced. Fine, did it. It seemed too loose and food got stuck in there and got infected. Sent me to another doctor who said I need root canal. Trying to just kill infection but started eating on that side and once again in the worse pain ever. Doctor said a crown can not fit properly if any infection. I say the infection was caused by a loose fit and trapped food. Do you think if i have a root canal that the infection will clear up and crown will then tighten up? I have a crown on top and bottom almost exactly across from each other and the one on top cracked a bit and the bottom one fell out. Could it be that one crow is too high and not lined up correctly causing for the crack..? i have crowns that lasted 20 years and these two were put in 2- 3 years ago. i’m thinking of changing my dentist as im not sure what the cause is as this never happened before and is very costly. Can you please tell me why my root broke after ten years with a crown on I thought crowns were for ever? I was given what I believe to be a porcelain fused to metal crown (I don’t know technical terms when it comes to dentistry) about 3 years ago after a root canal on my upper, back molar. Shortly afterwards I had braces and received a retainer that is in the style of those invisiline things that were really popular once upon a time. I have a habit of grinding my teeth both during the day and at night. Just recently the porcelain piece fell off and it wasn’t until I was flosing and noticed something felt odd and looked at the molar that I noticed. There is no discomfort or pain and the metal component itself seems completely intact, though I am still very cautious with that tooth because I don’t want the seal to get ruined or what little is left of that tooth to crack, as my family cannot afford an implant. Could the braces and retainer agitated the crown even further when added to the tooth grinding? I have had 2 root canals on my back 2 molars and new crowns placed over these. I have experienced a lot of pain, tender gums, bleeding gums, infection near these 2 molars. The crowns have come off a few times. The dentist replaced the crowns at no cost. I was told my problem was grinding and got a mouth guard. Finally, I consulted a prosthodontist who confirmed that I did not have enough tooth surface to support a crown. I am now going through tooth removal, bone graft, implants and then crowns. This has been very expensive over the last 2 years. I feel misdiagnosed by the endontist and dentist. Should I change dentists? Should I ask the endontist and dentist for a refund since their treatment was not what I needed? Hello, I had a bridge on my 3 lower teeth put on 5/15. Just recently I’ve noticed it seems to lift in the back only when eating. Went to my periodontitis last week and he said it was fine. Over the weekend while flossing I was able to get the floss completely under this back crowned tooth and it zinged with immediate pain. Went to my regular dentist today and he confirmed it was loose and told me to chew gum so the whole bridge can come off in one piece? Is this normal advise, also this is a root canaled tooth with a post. and now has dull throbbing that I am taking Tylenol for. Any advise would be very helpful. I might add that the front of the bridge is cemented on really tight still so if the back lifts off from gum chewing and would the pontic lift with it and what about the front of the crown? Any advise would be greatly appreciated. In 2000 I was dx’d with tn, meanwhile an endodontist did a second root canal hitting the nerve a second time. Then I had an upper tooth causing me pain so a dds did a root canal overfilled the tooth with too much amalgam and eventually this tooth falls and taps on lower tooth causing excruciating pain on side with TNA. I want a permanent solution. 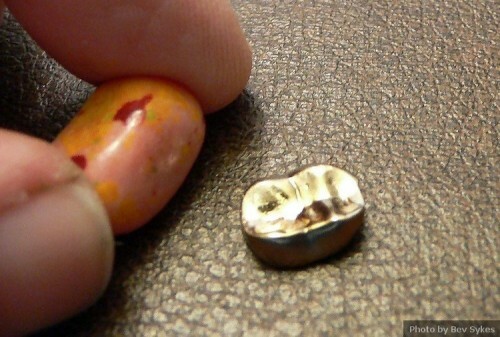 Does that mean I need an implant or can the amalgam be taken out and filled properly? Or, do I need to have it pulled for an implant? I’m in so much pain that I must do something. I’ve had it filed down which gives temporary relief until it falls again. I want a permanent repairs what to do? I lost a front crown about a month ago. About two weeks ago another front crown fell out. Tonight, a third one fell out. I have the last two but lost the first. These weren’t done all at once. So why are they all falling out so soon, one after the other? I bought some cement at the pharmacy. I don’t have dental insurance and even though I am a veteran who uses the VA, I am not service-connected. Right now, no dentists from here in Beaumont, TX, to Houston are open because of the flooding from Hurricane Harvey. Does regular jumping exercise can cause losening or falls off…of front tooth crown ??? This is the second time my crown came off. It is on my molar bottom right side of my mouth. The problem is now is that it is sore and I can’t eat anything on it. It also feels uneven. I have always had bad teeth since I was young, so I had a lot of cavities growing up so I have a lot of silver sealant on damn near all my teeth. NOw they have sealant which is the same color as your teeth. Is it dangerous if I wanted dentist to get rid of silver sealant and put sealant that match my teeth to fill in those areas? Hi, I’ve had two silver crowns for about 9 years now. One on my top molar and one on my bottom molar. Do you think they’d fall out while taking an impression of my teeth for a retainer? My temporary crown fell off within hours, before I had a chance to either eat or brush. I had little sensitivity in that area, so the dentist said I could just wait for the permanent crown since they had put a rush on it. So my question is this; should I be charged for that temporary crown when it fell off due to no fault of my own within hours? After 20 years, I bit into a soft Turkey & Cheese Sandwich to much surprise there was my top right eye tooth cap clean & no cement in cap. I made dental appt w/Dental Group seconds from my home. Intern & Supervising Dentist looked @ original tooth said put cap on. They said see you need new cap because cap not staying on you can see original tooth receding gum line. We can’t recement cause potential lawsuit if becomes abscess. I have no dental insurance & fixed income retired. They said use your temp dental OTC dental bond, fixodent, polyigrip until you can pay $1350.00 for new cap. I had no problem using temp OTC dental bond & I dont see receding gum line or discolored tooth underneath. I’m worried about bacteria, cavity activity when cap is out while I sleep even though I have become an expert w/caring for my teeth for over 50 years due to a sled riding accident @ 10 years old broke jaw had 250 stitches inside & out loss two front teeth, left eye tooth, tooth next to left eye took & six bottom front permanent teeth which are bridges now. Since I was able to use temporary OTC cement will another dentist is be able to do the same? I don’t drive & I hate to bother my family dentist since I only call him for emergencies & I haven’t seen him since 2016. Hi Mamacita, I have recemented permanent crowns when the gums have receded. As long as there is sufficient tooth structure and no decay, there shouldn’t be a problem recementing the crown. I hope that helps! My cap fell off my left back molar, it is Labor Day weekend, no dentist is available that I know of. My question is do I keep the cap in water or keep it dry until I can get in to see him? I don’t want to use any OTC cements as I am afraid I might swallow it in my sleep or loose it again when I am eating.